Three concepts to consider while setting the combine this harvest: (1) Can dockage be too low? (2) Change combine settings based on crop conditions. (3) Frost damaged seed might not be a total write off. Harvest is a great time to assess the incidence and severity of canola diseases, an important step in management for next year. 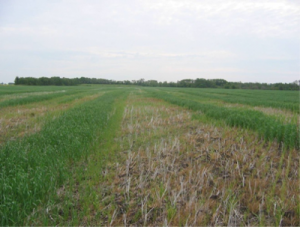 Post-swathing disease scouting is possible but results are not as accurate as pre-swath scouting. Already swathing, then had frost. Can I keep going? Yes, keep going. The recommendation to wait at least 4-6 hours after a frost to assess the extent of frost damage only applies to canola that was not quite ready to swath. If you were already swathing or were going to swath a crop that day, there is no benefit to waiting. Have you seen patterns like this? Potassium in swathed crop is mobile and if several rainfall events fall on the swath before combining, potassium will bleed out below the swath. Since a six-foot swath contains all the straw from a 30-foot or wider cut, the K is concentrated. K-loving crops following canola can find sufficient K below the swath, but inadequate between swaths. Moist conditions mean more soil clinging to machinery wheels. This increases the risk of moving clubroot as well as weed seeds and insect pupae around the farm. With the discovery of a potential new clubroot pathotype, growers will want to take time to sanitize equipment between fields. Storage risk is reduced significantly when canola moisture is 8% or lower and temperature is 15°C or lower. 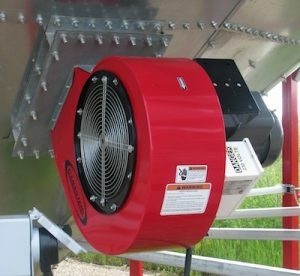 Turn on the fans to cool that hot canola. 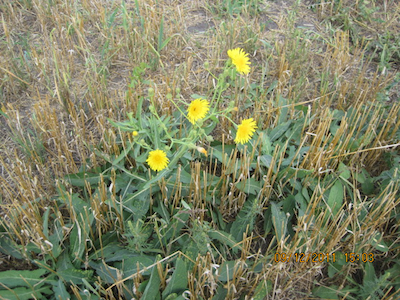 Fall is a good time to control perennial and winter annual weeds. The message this week includes two reminders: Wait for post-harvest regrowth. And know the best timing for the weeds present. The photo shows narrow-leaved hawk’s-beard.